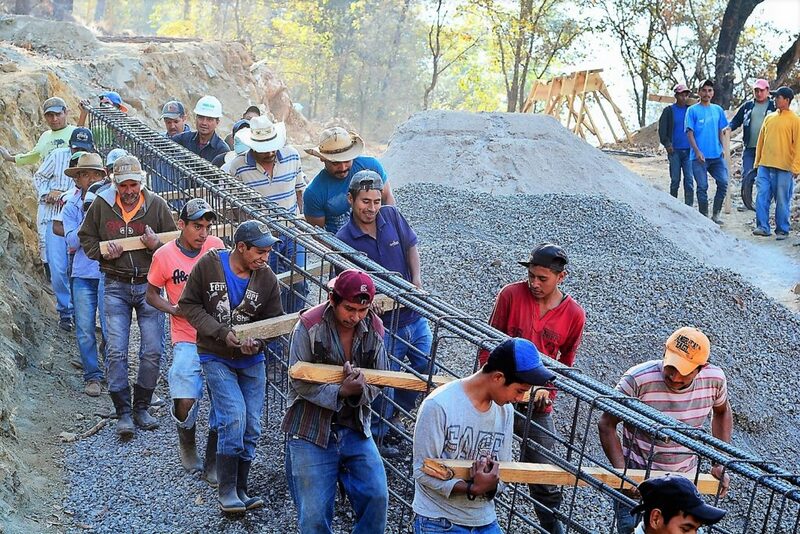 Engineers Without Borders USA (EWB-USA) has been working in the Joyabaj municipality of Guatemala since 2005. Below, EWB-USA Fellows Benjamin Cook and Kerry Drake give a firsthand account of the logistics required to complete a vehicle bridge that will serve 20,000 people. To get from the capital, Guatemala City, to the municipality of Joyabaj takes three hours on twisty mountain roads that are mostly unpaved. The area between the two places is extremely rural and dry, with scenes on repeat of dry corn fields awaiting the rainy season and a few hearty cows here and there on the steep slopes. This is Maya country. After passing extremely small “towns” that consisted of a few houses, we were surprised when we arrived in Joyabaj, a town of about 20,000 people. It is actually quite dense and walkable. In the early evening hours, the sound of a marimba comes through our open window, along with a light breeze and the afternoon sun. Someone has been playing the marimba, a xylophone-type instrument, nonstop for several hours. It’s possible the music is for some sort of party, since there have been occasional firecrackers going off as well. Just a typical Wednesday afternoon. But our time as town tourists was short-lived. The morning after our arrival we grabbed our work clothes and headed to the community of Llano Grande, located about an hour outside of Joyabaj in the municipality of San Martin, to help finish a bridge build that was underway. It is well into the dry season in Llano Grande. When we arrive, the EWB-USA team is on the final week of a five-week vehicle bridge build. The bridge connects two sides of the Camino de los Caballos River [way of the horses] where there was no bridge before. In days gone by, residents found easy crossing on horseback. But during the rainy season, the crossing is treacherous and often impassible. An old wooden pedestrian bridge became the rainy season solution. If crossing was necessary — for access to schools, markets, medical care — people would leave their vehicles on one side, walk across the bridge, and arrange for someone to pick them up on the other side. In severe storms the crossing was impossible. The bridge EWB-USA is constructing with help from the Llano Grande community and volunteers from surrounding areas will provide a solution to this dire problem. EWB-USA designed the bridge and provided onsite construction supervision. The community provided wood, rocks and unskilled labor, and the municipal government paid for the remaining materials and the skilled labor. The new concrete vehicle bridge is named el Cantil [the ledge]. El Cantil stands approximately 7 meters tall and spans 15 meters across the canyon. It is engineered to hold a semi-truck, per American Association of State Highway and Transportation Officials (AASHTO) standards. It will serve 13 communities of approximately 20,000 people in the San Martin municipality, giving them access to the hospital, schools, markets and other services in Joyabaj as well as a connection to the road to Guatemala City. 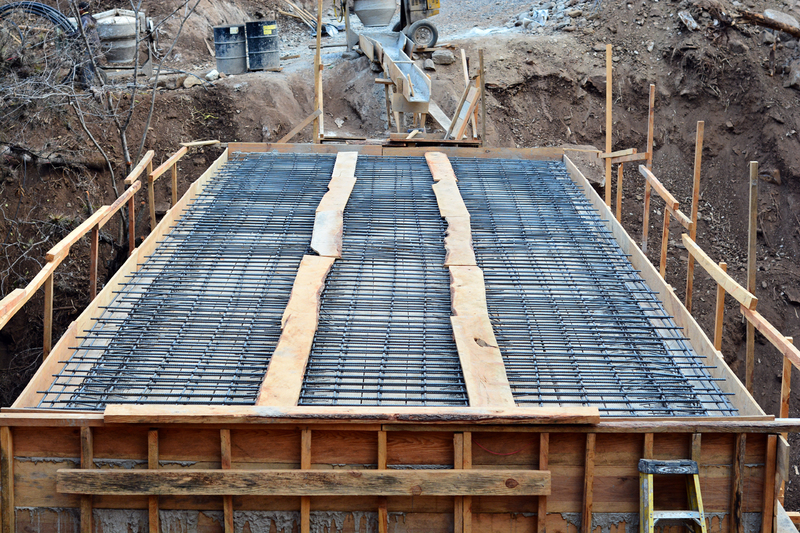 It took the project team and volunteers several weeks to build up formwork and pour the foundations for the bridge. The formwork creates a mold to hold the steel and concrete, which will be the bridge’s final structure. A lot of time and effort is put into designing and building the formwork … but at the end of the day, it will be torn down! All of the timber for the formwork was sourced from the surrounding hills. The quantities and sizes of planks and lumber were cut to order by a man with a chainsaw. They were amazingly straight and accurate. The formwork will be removed after a 28-day cure, and the communities will divide up the lumber to use for other projects. On our first two days at the site, we worked on finishing the wooden formwork, which included measuring and sawing planks and nailing them into place to form the deck and the beams. We also built a ramp that would carry the concrete from the hillside to the platform. Tools are spare, and there are few pre-fabricated products. For example: do you need a ramp, sawhorse or handrails? Build them yourself with the lumber on site. 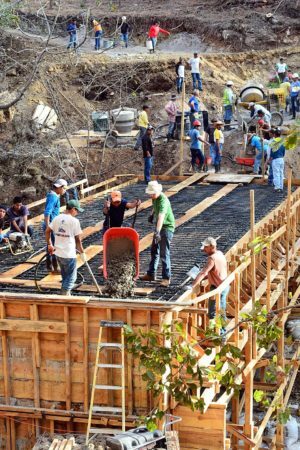 Every day volunteers from Llano Grande and the other communities this bridge will serve provided volunteer labor, usually between 10 and 20 men. Eighty volunteers assisted the day the deck was poured! 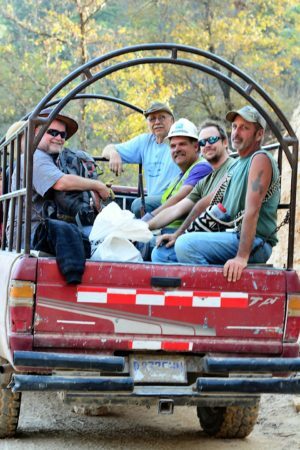 All of the volunteers seemed happy to contribute to a project that will provide safe passage for them and their families for generations. On the third day, it was time to place the steel beam. The steel beams were tied and prepared days in advance. A group of 40 men lifted the steel and slowly carried each beam down to the awaiting formwork, casting the visual effect of a human centipede. There was a tricky turn and slippery gravel slope to navigate, but in the end all beams were placed successfully. The procedure was repeated three more times for the other beams. On days four and five, concrete was poured for the beams. Two beams per day, so as to spread the load and not overtax the formwork. 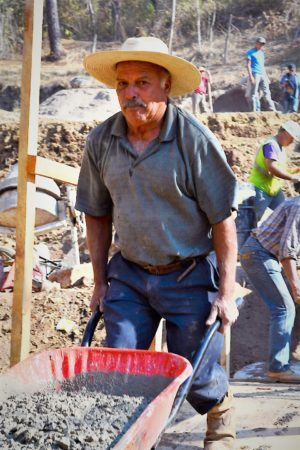 One of EWB-USA’s most seasoned volunteers manned the mixer, directing teams of men to bring the correct quantities of water, rock, sand and cement. Wheelbarrow after wheelbarrow-full were carted down to the team with shovels and vibrators (and when the vibrators cut out, a scrap piece of regla). A small hose brought water up from the river, but when that wasn’t enough, two men began carrying buckets on their shoulders. During the beam construction process, other teams focused on building up retaining walls that connect the bridge to the road; they will hold backfill to complete the driving surface. One wall was constructed of stone-filled gabions, and the other three were hand-placed stone masonry walls. All of the stone was gathered by local residents from their farm fields. With the beams poured, the rebar was put into place for the steel deck. A team of men worked slowly across the deck, tying bars together. 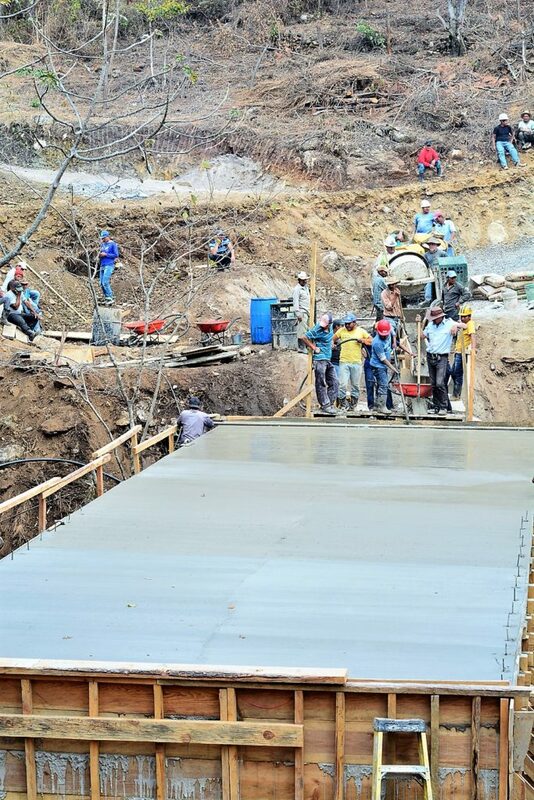 It took about five hours of continuous work to place the concrete, but finally the deck was poured! EWB-USA’s role in the build has now ended. The formwork has been removed and 13 communities now have reliable access to important services, rain or shine. And, of course, a large marimba-filled fiesta was held to inaugurate the bridge.